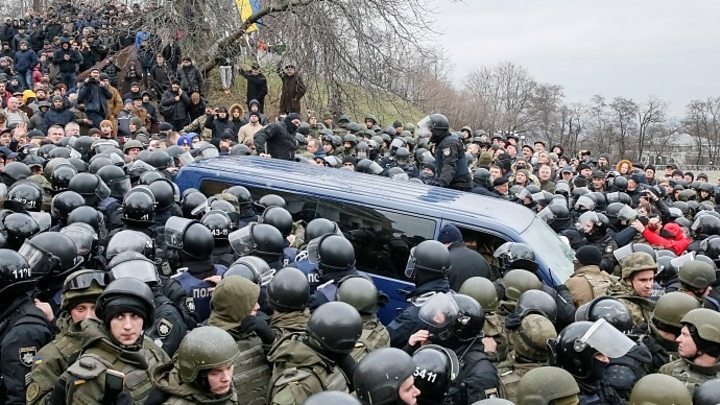 Media captionJonah Fisher watched as Mr Saakashvili's car was surrounded by his supporters and Ukrainian police. Supporters of former Georgian President Mikheil Saakashvili have freed him from a police van in Ukraine's capital Kiev after his detention on suspicion of assisting a criminal organisation. Mr Saakashvili, 49, then urged the crowds to impeach President Petro Poroshenko, a former ally. Mr Saakashvili was made a Ukrainian citizen in 2015, automatically losing his Georgian passport. He was stripped of his citizenship's in July and is now stateless. He has accused Mr Poroshenko of failing to root out corruption and being corrupt himself. Mr Poroshenko has denied such allegations in the past. Will Mikheil Saakashvili bounce back? With one hand in handcuffs and surrounded by hundreds of people, Mr Saakashvili urged his supporters to march to the Ukrainian parliament. "I urge you to start a peaceful protest to remove Poroshenko. You should not be afraid," he said through a loudspeaker. Ukraine's prosecutor general said Mr Saakhashvili had 24 hours to hand himself over to the authorities. Earlier, before he was freed, masked officers had dragged him from his home. Several people were injured in scuffles between police and Mr Saakashvili's supporters. Mr Saakashvili's detention was part of an operation "to disrupt a plan of revenge of pro-Kremlin forces in Ukraine", Prosecutor General Yuriy Lutsenko said. He is suspected of receiving financing from a criminal group linked to ousted President Viktor Yanukovych, Mr Lutsenko added. Prosecutors also released audio and video recordings which they say proved that Mr Saakashvili and his supporters had received hundreds of thousands of dollars from the group. Mr Saakashvili said the recordings were fake. If found guilty, he could face up to five years in jail. Mr Saakashvili also faces the threat of extradition to Georgia, where he is wanted on corruption charges. He claims the accusations are politically motivated. He previously served as governor of the southern Odessa region after being appointed by Mr Poroshenko in 2015. Before moving to Ukraine, Mr Saakashvili served for almost 10 years as president of Georgia.